Congratulations Caleb Carling, you have won this wonderful Christmas romance!! You and your wife will have so much fun reading it together. I’m so excited! I’ve been working with Kimberly Krey on getting this new giveaway up and running. 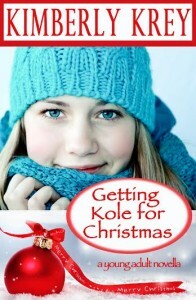 Kimberly has donated a brand new autographed copy of her new release: Getting Kole for Christmas. Not only is she extremely talented and gives us readers a good story she is extremely sweet and makes time for my questions and has agreed to an interview. Please join me in getting to know Kimberly Krey. I just wrote and released (well, pre-sale-released) my very first novella. Which also happens to be my first holiday book. It’s about a darling high school girl named Kylie who’s in love with her very best friend; his name is Kole and it’s called Getting Kole for Christmas. The 126-page book releases November 1st. I first discovered my love for writing in college. My tough-grading English professor gave the class a creative writing assignment. I still remember sitting in the lamp-light’s glow of my basement, typing the paper about a fall scene. Gnarled branches and brittle leaves. I really let myself sink into the scene, and something about it made me feel alive. Upon handing it in, I found the teacher gave me – not just an A, but an A-plus on the assignment (which was quite rare for her). I came away from that realizing that I enjoyed writing, and that I might be able to develop myself in that area. It really depends. The first book I wrote, Evie’s Knight, had fantastical elements. That, along with the fact that it was my first novel, made it a longer write. It probably took close to two-and-a-half years or more. Now I’m closer to six-to-eight months, which includes about two months of editing, beta reading, and formatting. I’m to the point now that my kids are all in school, so I write while they are gone. I usually don’t touch the book on evenings and weekends, unless I’m getting close to finishing and feeling pinched for time. I also don’t write a whole lot in the summer, since my kids are home and I want to spend time with them. I do still set time aside to write (or I’ll go crazy), just not a lot of it. Before they were all in school I wrote late into the evening (once they were in bed) and woke up early to write as well. There are a lot of authors I love, but my very favorite is Marcia Lynn McClure. I absolutely love how she can write a clean romance book with passion and kissing and heart-melting scenes. That’s, of course, exactly what I strive to do as well, since that’s what I love to read. I do! My husband is a photographer, and I used to help him create montages and special prints by using PhotoShop. Because I’m familiar with the program, I am able to create my own covers with ease. I’d say getting involved in your local writing community is one of the best things you can do. Writers are EVERYWHERE, so get online and find them. There are writing conferences, workshops, classes, critique groups and retreats. I’m all for doing online research about writing, (I did TONS of that too) but there’s nothing like getting involved, meeting new people, and getting feedback about your work. *If you do get in a critique group, read a few popular blog posts about how to find and be a good critique partner; you want the experience to help you grow, not smother your joy for the craft, and if you get the wrong person critiquing your work it can do just that. I’m working on Fresh Starts. It’s the last in my Second Chances series. Here’s a short blurb: Bree has had her fair share of difficulties. The loss of her parents, a not-so-recent divorce, and the disruption of her life caused by a dangerous stalker who’s serving jail time. When the determined criminal finishes his sentence, Bree is sent into hiding. While she’s doing all she can to steer clear of this frightening piece of her past, a new man enters the scene, determined to be part of her future. The winner will be chosen by rafflecopter and announced here as well as emailed and will have 48 hours to respond or a new winner will be chosen. This giveaway is in no way associated with Facebook, Twitter, Rafflecopter or any other entity unless otherwise specified. The number of eligible entries received determines the odds of winning. Giveaway was organized by Kristina Applegate from Courting Fiction and sponsored by the author. VOID WHERE PROHIBITED BY LAW. This entry was posted on Tuesday, October 27th, 2015 at 18:52	and is filed under Giveaways. You can follow any responses to this entry through the RSS 2.0 feed. You can skip to the end and leave a response. Pinging is currently not allowed.